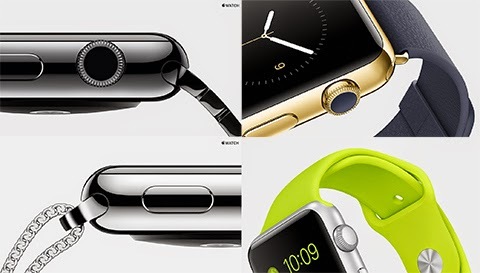 Home Gadgets Apple Watch Price and Availability Now Official! Apple Watch Price and Availability Now Official! Apple today announced that Apple Watch, its most personal device yet and the newest innovative addition to Apple’s ecosystem, will be available on Friday, April 24 to customers in Australia, Canada, China, France, Germany, Hong Kong, Japan, the UK and the US. Apple Watch introduces revolutionary technologies including the Digital Crown, an innovative way to scroll, zoom and navigate fluidly without obstructing the display. The Retina display with Force Touch on Apple Watch senses the difference between a tap and a press, providing a new way to quickly and easily access relevant controls. The all-new Taptic Engine discreetly delivers a gentle tap on your wrist whenever you receive a notification or message. Designed to be worn throughout your day, Apple Watch delivers up to 18-hour all-day battery life and comes with a unique charging solution that combines Apple’s MagSafe technology with inductive charging for a quick connection that simply snaps into place. Apple Watch is available in three collections, Apple Watch Sport, priced at $349 and $399; Apple Watch, available from $549 to $1,099; and Apple Watch Edition, crafted from custom rose or yellow 18-karat gold alloys, with prices starting at $10,000.